Training that increases your win rate. A speaker who will ignite excitement and improve team performance at your next sales meeting or conference. Like you, our clients have faced some big challenges: Winning more business in tough markets. Selling on value instead of price. Preparing non-sales people to deliver a persuasive message. Changing a technical or operational culture to focus more on sales. We helped an international training firm win 7 out of 8 major bids in one year. We helped a top 5 global bank to increase their win rate from 19% to 63%. And we helped one of the world's largest facility management firms win 12 out of 13 enterprise-scale deals after we redesigned their proposals. These aren't isolated results. A survey of over 400 clients showed that on average our client's win rates increased by 39%! How do we do it? We use a research-based methodology that draws on insights from cognitive linguistics and psychology. It has been proven to work in thousands of opportunities. Increase your win ratio with the world's best proposal and presentation training. Deliver the right message the right way to produce bottom-line results. Inspire and educate your team. Energize your sales meeting. Give your team the power to deliver a winning message every time. Add the world's # 1 proposal expert to your team. Sign up for a monthly tip from Dr. Tom Sant - practical, insightful, and entertaining. Dr. Tom Sant has been called "America's foremost expert on persuasive communication" by the American Management Association. He was named the first-ever Fellow of the Association of Proposal Management Professionals. And he was named one of the Top 10 Sales Trainers in the world by Selling Power. 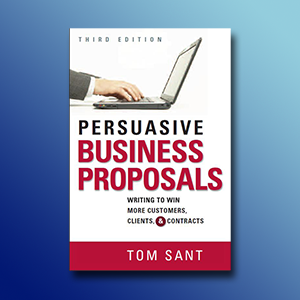 With over 100,000 copies sold, Persuasive Business Proposals has helped hundreds of individuals and organizations create dynamic, effective proposals. Now in its third edition, the book still gives readers simple, effective techniques for organizing, writing, and delivering winning proposals while updating the author's strategies to work in today's connected, global business environment. Learn More or Get it Now! 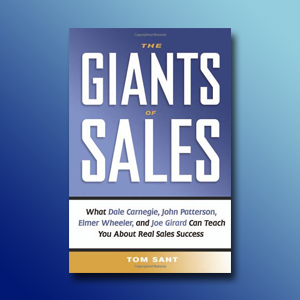 The Giants of Sales introduces readers to John Henry Patterson, Dale Carnegie, Joe Girard, and Elmer Wheeler — all true innovators of great salesmanship. The book presents the fascinating, time-tested techniques of these sales gurus, and demonstrates how they are still powerful tools salespeople should use today. Part history and part how-to, this unique book literally brings the sales strategies to life in the stories of the men who developed them - and changed the face of selling forever. Language is the medium of business. To be successful, we need to communicate effectively in writing. That's true whether we are providing instructions to our colleagues, communicating with our customers, or advising our direct reports. We must be able to deliver clear, accurate messages that inform, persuade and motivate. Unfortunately, people lapse into habits that interfere with their ability to communicate. 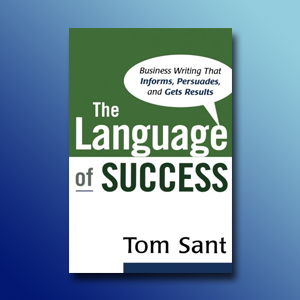 The Language of Success shows readers how to avoid these mistakes, and to write lucid, concise, and accurate e-mails, letters, performance appraisals, and presentations.